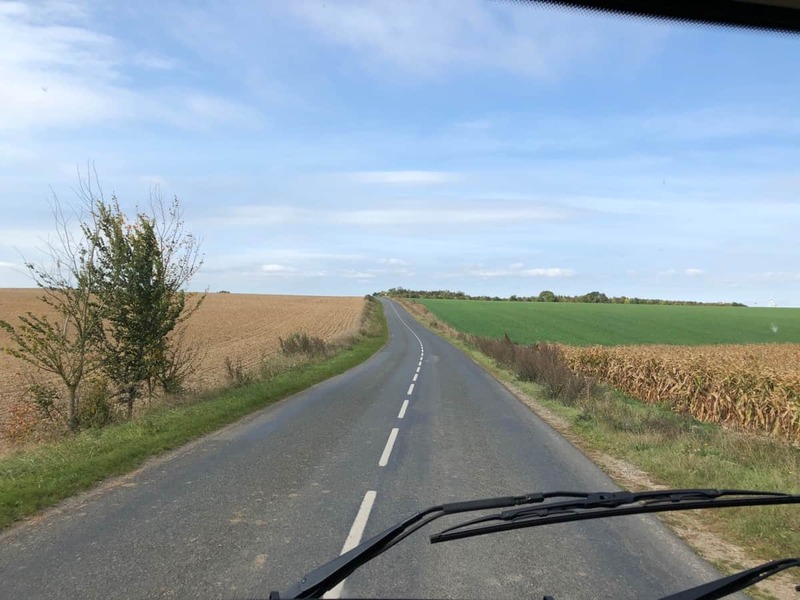 Travelled: 151 kms from Péronne via Nuncq Hautecote to Watten, in the Region of Calais. Budget: 127 days @ €92 per day. 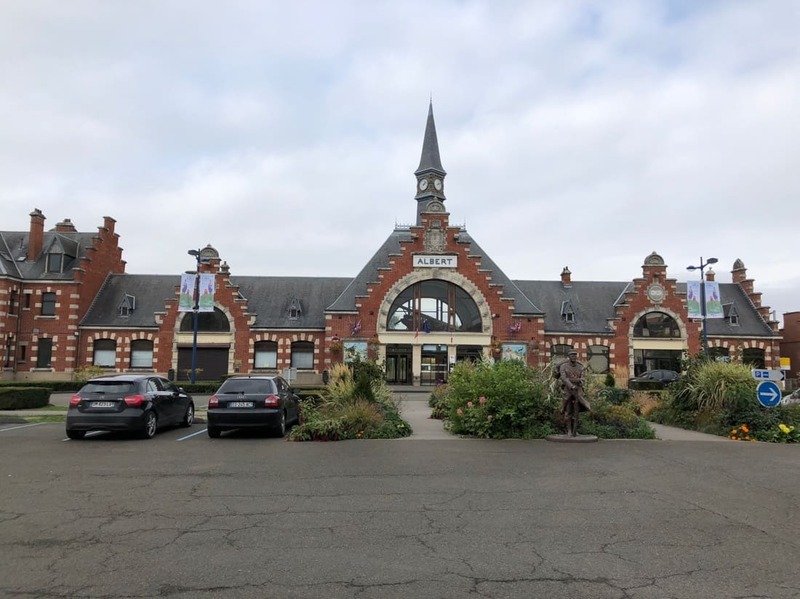 Having enjoyed Péronne’s museum we continue north-west for Albert in the Somme valley. 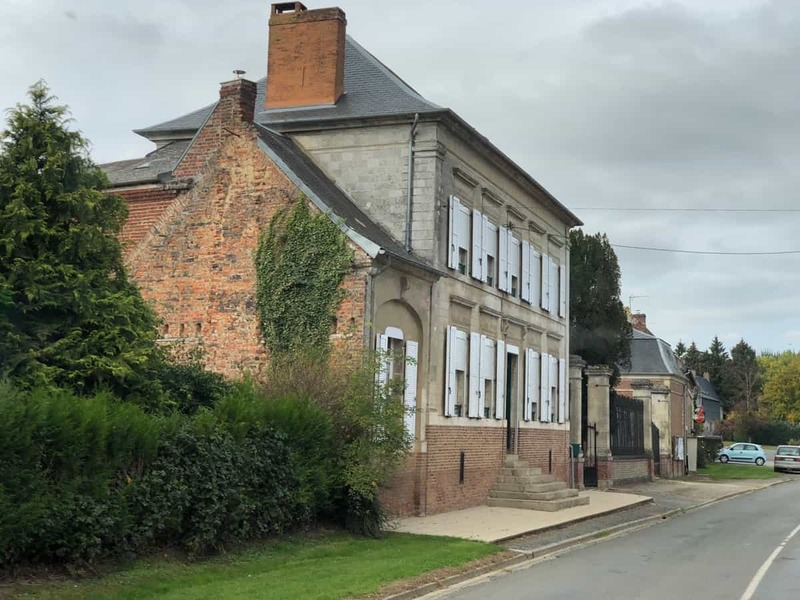 Albert stands on a major crossroad, it was of strategic importance during the battle for the Somme. Poziére to the north-east and Villers-Bretonneux to the south-west. Tens of thousands of Australian marched through Albert to war. We have passed through it 2-3 times but never stopped. 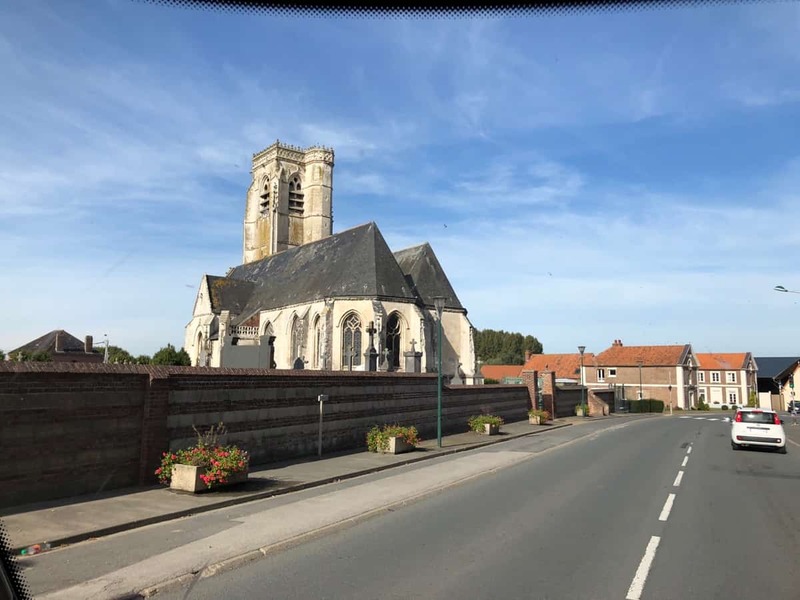 As we had a late start from Péronne, its lunch time as we drive in and find a parking spot in the old centerville. 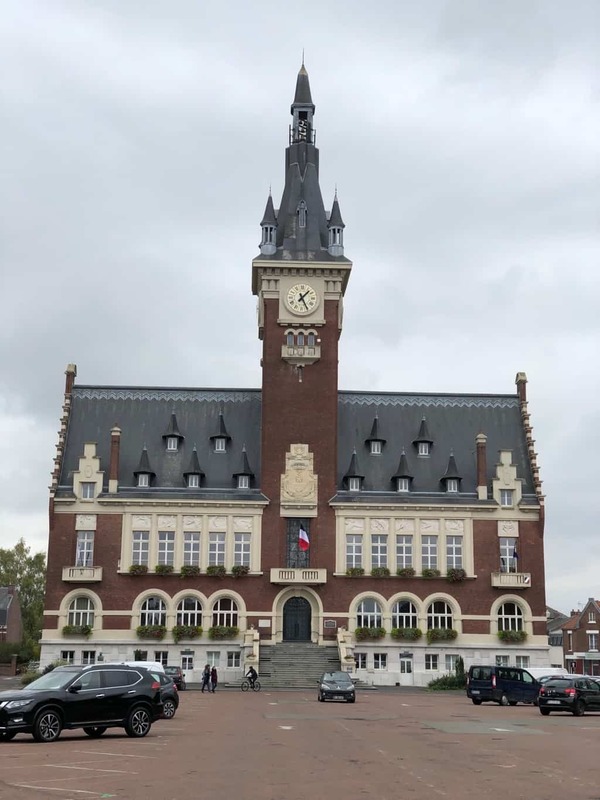 The amazing Mairie or Town Hall in Albert. The Flemish routes of this area reflected in its design. The old railway station, now partly a museum is a grand building as well. We see lots of Australian flags as we wander. 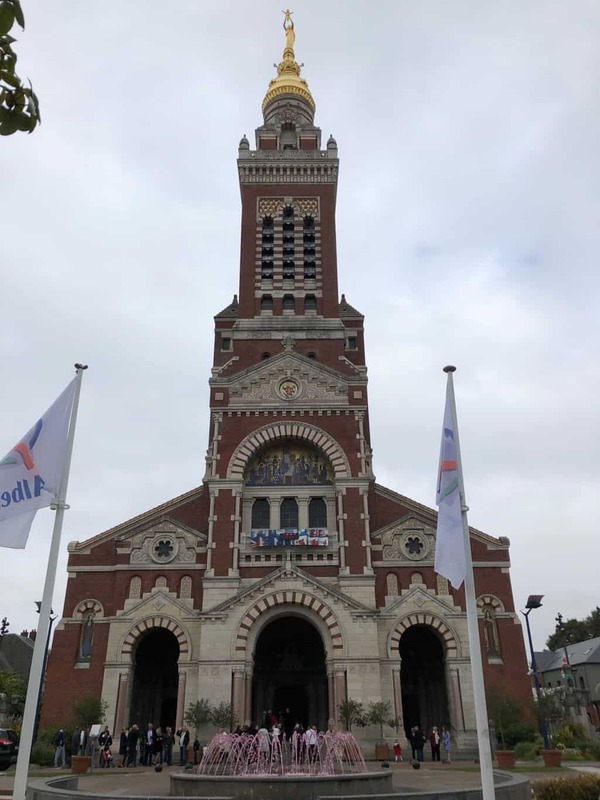 The Notre Dame de Brebiéres Basilica in Albert. 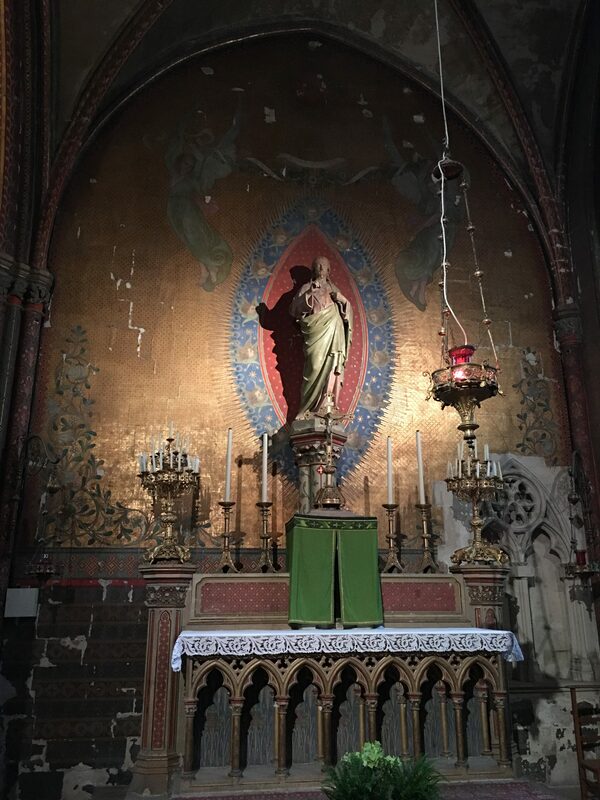 More famously known as the Church of the Leaning Virgin. Built in 1897, it was the focal point of German shelling of Albert during WW1. It was virtually completely destroyed, only to be re-built by the original architect’s son in 1931. From the nave looking forward to the main alter and apse. 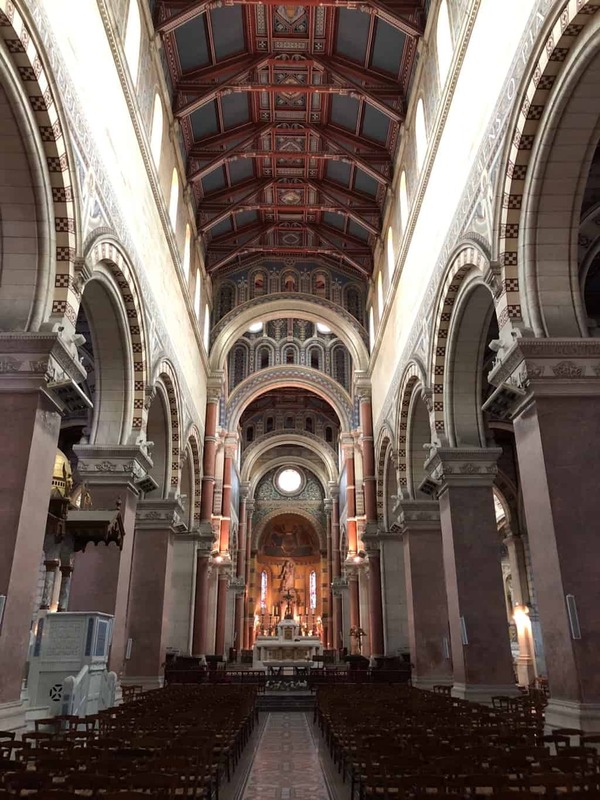 The blurb describes the Basilica as being built in the Neo-Bysantine style. 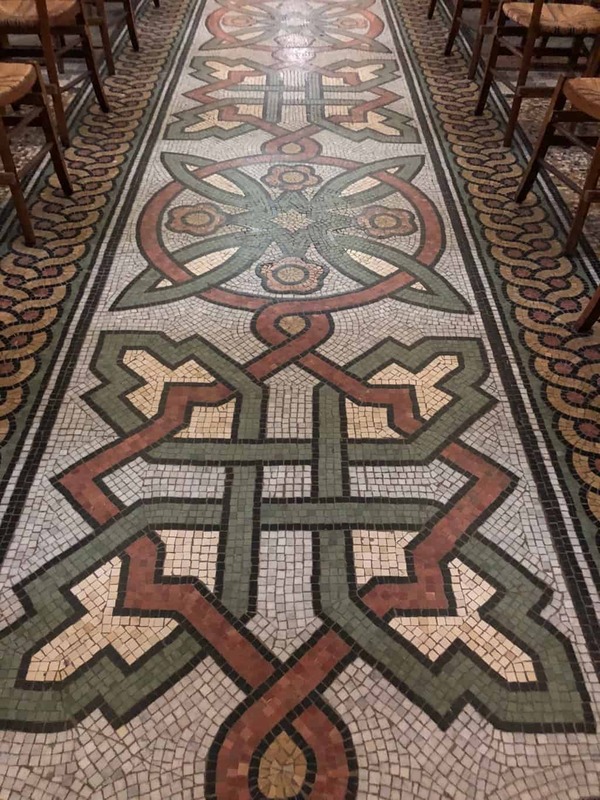 Not sure exactly what that is, but the patterned mozaics certainly remind us of some Churches we have visited in Greece and Turkey. 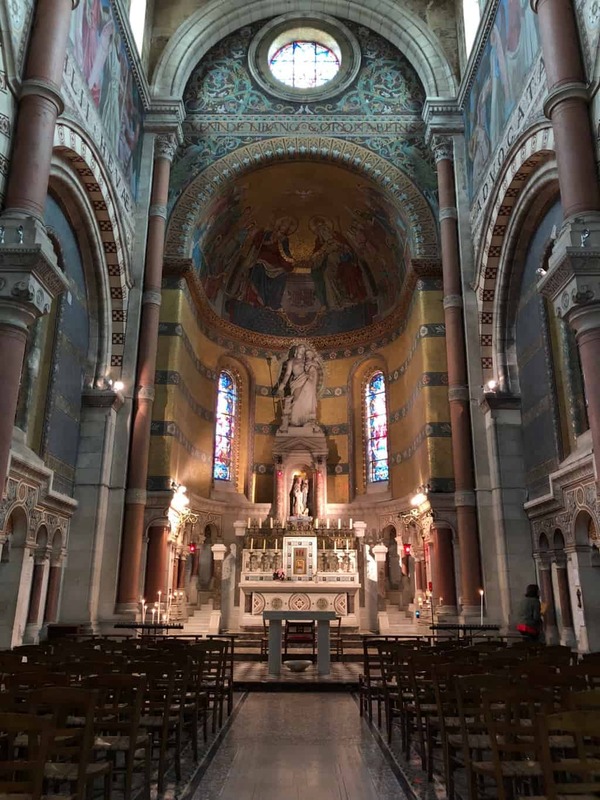 A closer look at the apse, the blue green tones works nicely with the pink stonework. Mind you it’s not a thousand years old, less than 90 in fact. Back in the Hymer, we have lunch in the car-park. Pam authorises €3 worth of chips from a nearby fritterie van, so lunch is a little special on this coolish afternoon. Soon enough we are back on the road. 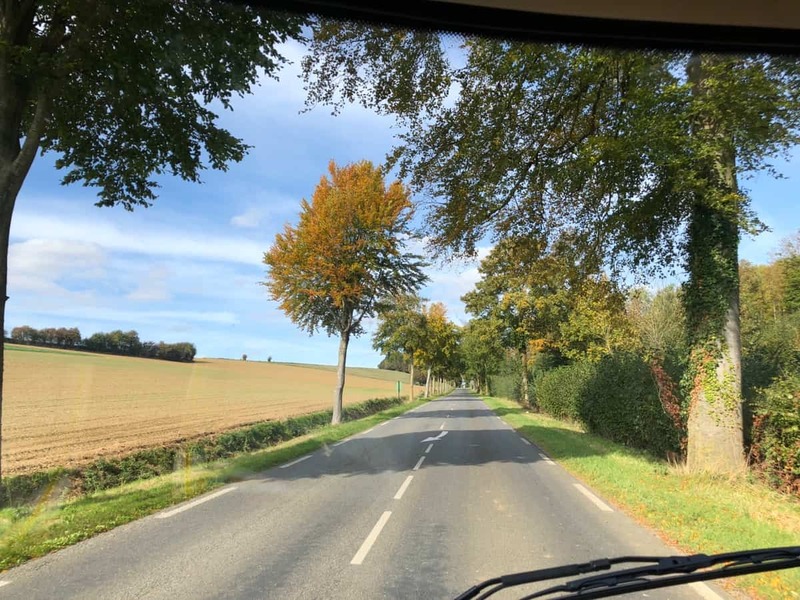 Driving the French D roads again. 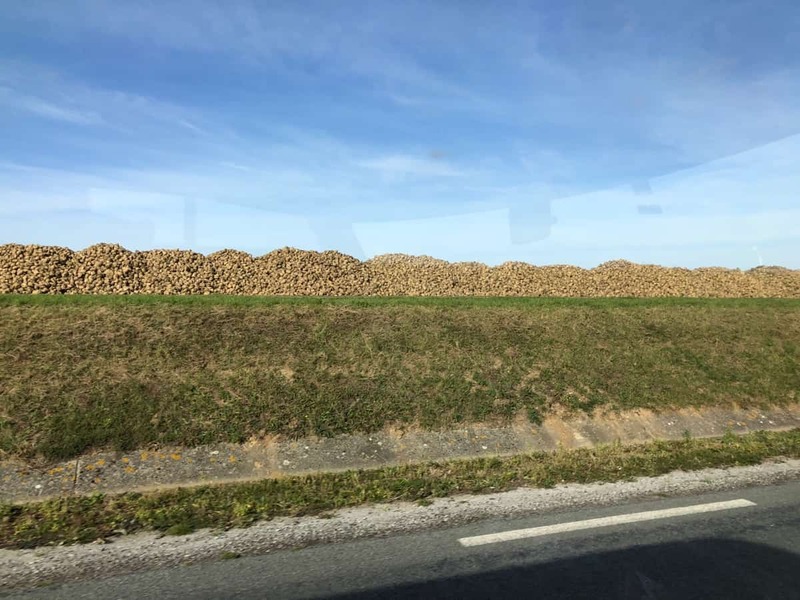 Mountains of potatoes line the road-side. The grey skies clear as we pass through Doullens into the Pas-De-Calais region. We find this lovely little private aire in Nuncq-Hautecote. At €10 including all services it’s not as good as free, but it’s very neat and tidy. We have a quiet night in Nuncq-Hautecote N50.30494, E02.29371. It’s a misty start to the day, but the sun brakes through and it looks like our last day in France will be a good one. 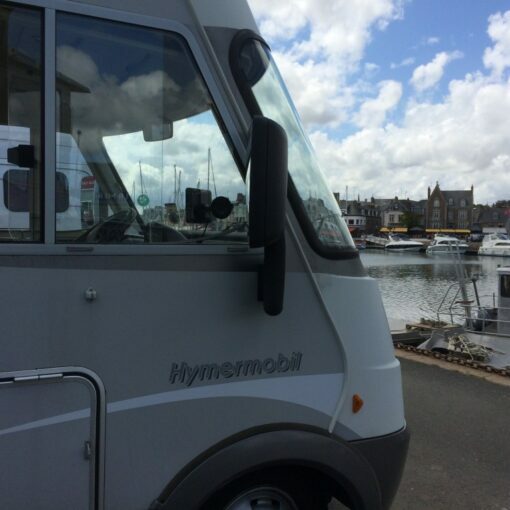 After a slow breakfast we service the Hymer (see picture above) and make for Watten. 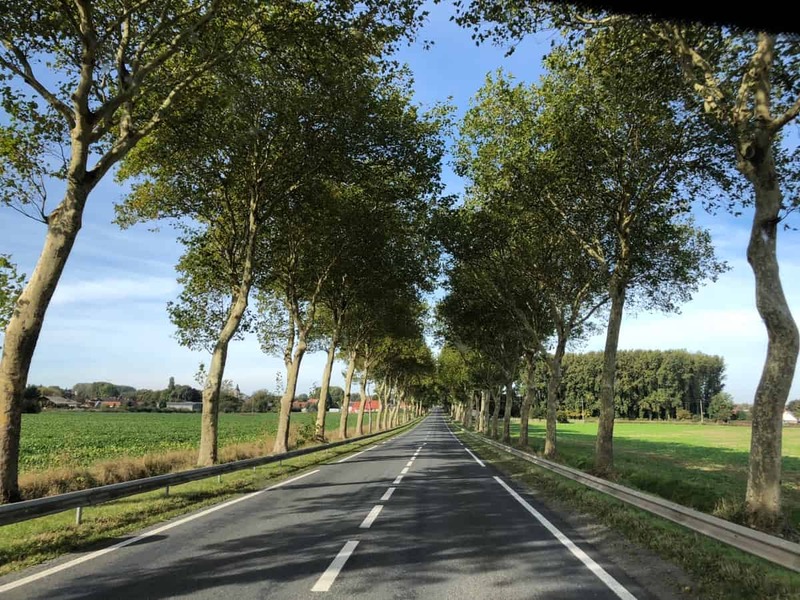 More D roads, line with French plane trees. These ones still relatively immature. 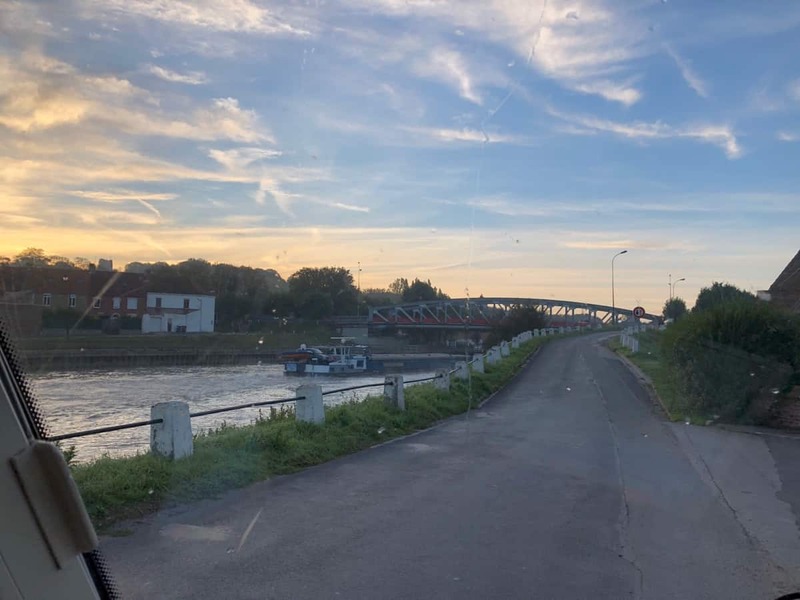 Watten has become our ‘aire of choice’ prior to departing France on the chunnel. 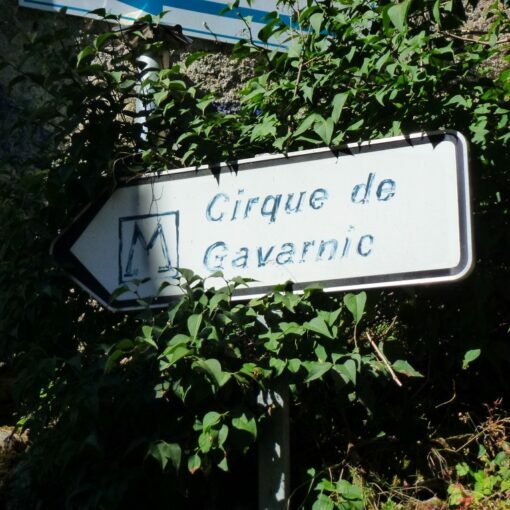 It’s free, feels safe, has an excellent boulangerie and a couple of nice bars. Nearly forget, it’s only 30 minutes from the terminal. Arriving in Watten we are pleasantly surprised to find the aire has been expanded and is now twice the size. We have organised a night here with Ian and Joe from Brisbane as they are crossing over to England and returning home as well. So it’s an afternoon and evening of talking about our various adventures since our last meeting. We are joined later by David and Belinda from Western Australia, who have been travelling Europe in their motorhome for 4+ years. 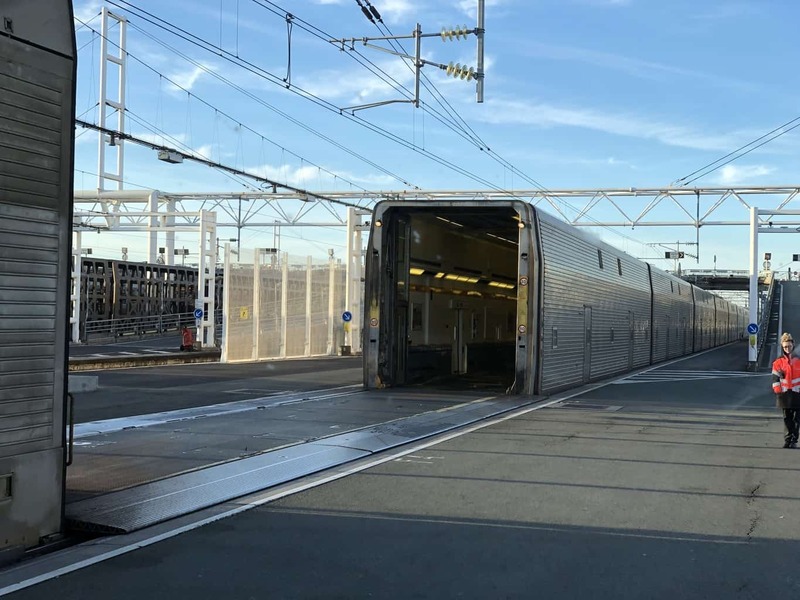 Tomorrow morning it’s the chunnel and a few days back in England. 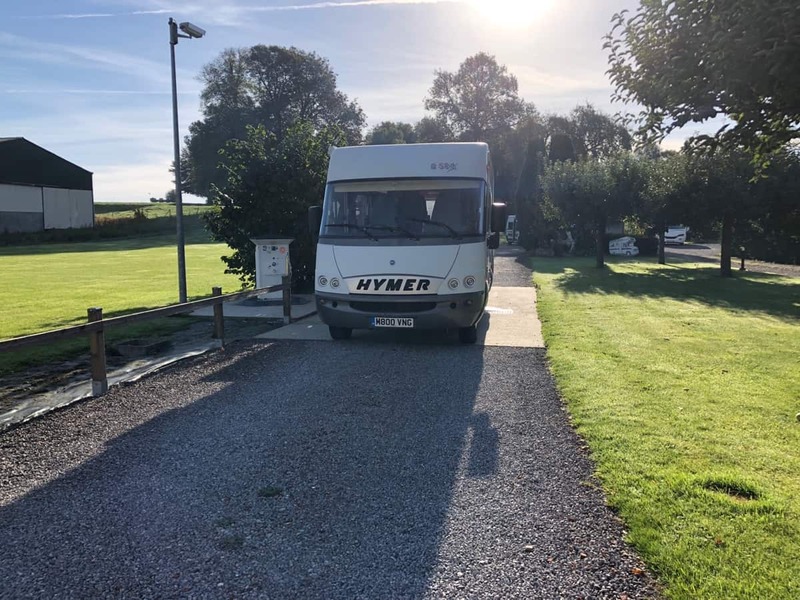 We plan on visiting John and Linda from Kent (who we met in Malta), then catching up with family, before packing up and getting the Hymer ready for storage. 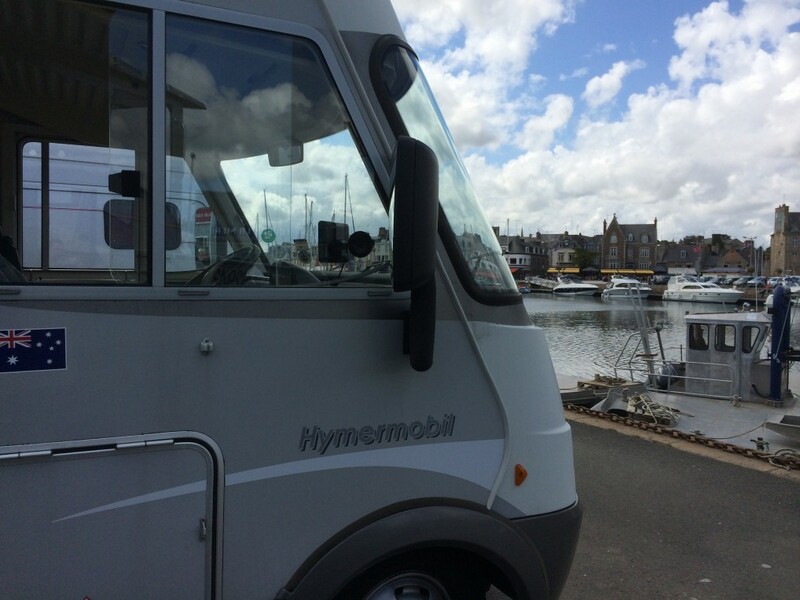 The Hymer travelled 12,630 kms in 127 days. We travelled another 1185 kms by ferry. We stopped overnight in 102 different locations. 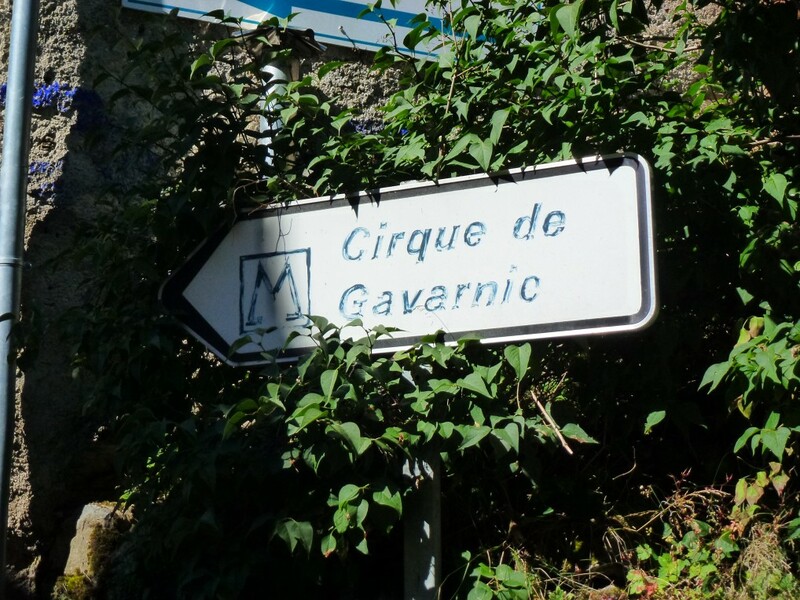 We were overbudget by a few hundred euros, mostly in the ferries and tolls column. Scotland was wonderful, Orkney even better, but we had great weather. Southern Italy, Sicily and Malta were very hot, have an air-conditioner or go in spring or autumn. In southern Italy the roads are atrocious, central Italy they are just bad, northern Italy not so bad. Mind you Italy grows on you, free stops are easy to find, so is water. So we did really enjoy it.! Malta was an adventure from day one. Not really motorhome friendly, but generally welcoming. The scooter worked out well. It’s a lot easier to park. Fitting the rear air-bag kit to the Hymer, was an excellent investment. Last but not least, thanks to the other Australians and the occasional pom we have met, skyped and emailed with along the way. We have enjoyed your friendship. Hi Guys, have enjoyed following your travels, enjoy your last few days and look forward to catch up at home. Keep safe. Hi to you Michael and Pam, we have enjoyed following your travels. Safe journey home. And hi also to David and Belinda who we met near Lake Garda, Italy, and whose travels we have also followed. I am interested to know have you known one another or did you just meet up in France?